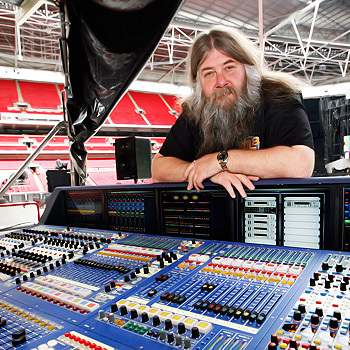 Metallica’s long-time FOH engineer and equally long-standing Midas devotee Big Mick Hughes has fulfilled the promise he made when Midas announced the development of a digital mixing system: to take it on tour with Metallica as soon as it was ready. The moment arrived in late June as Metallica embarked on a 12-date tour of shows and festivals across Europe, starting in Lisbon and ending in Moscow. As all shows plus two days of production rehearsals took place during just three weeks, two identical control and backline systems leapfrogged their way across Europe, with both XL8s supplied by Canegreen via the M7 Group, which facilitates UK XL8 rentals. Despite providing feedback throughout the entire XL8 development design process, Mick admits to some trepidation when it came to abandoning his trusty XL4 – which he personally owned – in favour of the new technology. “I always considered myself an analogue diehard and I’ve used Midas since the Pro 1,” he says. “I tried most other digital consoles along the way but I never felt comfortable. The XL4 is a heavy beast, it feels firm and positive, whereas some of these digital consoles just didn’t feel substantial, and I’m too big to deal with anything that dainty! And I was never convinced by the way they sounded; there was something inherently wrong. So when Midas said they were coming up with a digital console I thought if there was one I’d like, this would be it. “If I was going to change to a digital console it would have to be something I could operate and feel comfortable with. The last thing I want to do is scroll through a load of pages to do one little thing, and while I’m doing that I’m missing something else. As an engineer I wanted it to feel semi-analogue; I wanted to be able to touch a knob on a channel, press a button and send a channel to stereo, turn a gain, push a fader and have sound come out of the PA. The operation of it is so simple, there are actually pictures of the units and channels and somehow feel like you’re plugging them in, so it’s perfect for me. If it’s going to be used by everybody, people walking up to it cold have to feel some level of comfort. Despite the amount of increased features and technology at his fingertips, Mick likes the fact that it hasn’t changed how he works. Mick has ditched his copious outboard rack and is using the desk’s onboard processing for pretty much everything. “I have one external effects unit – a multi effects unit which does one thing in a song which has to happen, and that’s it,” he says. “I really like the DN780 Klark Teknik reverb which has been emulated digitally in the desk, so for me to use them is great.